Interviewer: Not many body parts get beat up as much as our feet. Bone spurs, bunions, gout, none of this sounds pleasant. 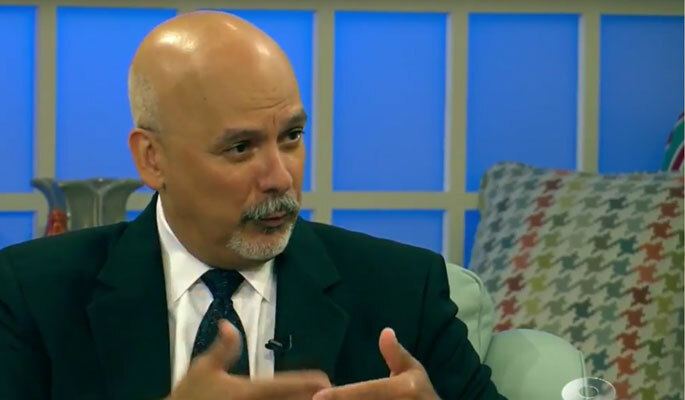 Dr. Abraham Rivera from Florida Pain Relief Group joins us now with ways we can fix these problems, and more. Dr. Rivera, good to have you back on Daytime. Interviewer: I’m happy to say I’ve never had a bone spur, but I’ve heard they’re horrible. Tell us what exactly is a bone spur and how can you help somebody fix that. Dr. Rivera: The foot is a very complicated structure. It works, at the end of the day, like a bow and arrow. You have a surface that is made out of a tendon, which would be tantamount to the string on the bow and arrow. And you have bones that are bent, and the string keeps them bent. The places where the string attaches to the bones can grow bone spurs, and those can be very painful, especially when you put traction on that string, on that plantar fascia, which is the bottom of the foot. Interviewer: What happened? Did the string let go or something? Is that why the bone spurs? Dr. Rivera: The string is awfully hard so it doesn’t let go, but the string is constantly pulling on those bones. It’s kind of like you have a rope glued to a piece of drywall and you keep pulling on it. Eventually, the drywall kind of sticks out and protrudes out. That’s what happened. The bone spur grows out of the bone, literally. It causes pain every time you press on it and so forth. Interviewer: What can you do to help somebody that has that? Dr. Rivera: The first step, as I always tell my patients, is prevention. How’d you get here in the first place? Shoe wear. Interviewer: Shoes, yeah. Bad shoes? Dr. Rivera: I hate to tell you. Interviewer: You’re looking down at my feet right now. Dr. Rivera: You know, those things were not meant for walking around. Interviewer: They’re not meant for human beings at all. They really aren’t. Dr. Rivera: Correct, correct. They’re meant for TV anchors. Interviewer: Exactly. And since you’re sitting, you’re fine. Dr. Rivera: Adequate shoe wear. You have to have adequate arch support. And there’s a whole industry built around these things, from arch supports to orthopedic shoes. Truthfully, at the end of the day, go see your cobbler. It’ll cost you very little, and he will make you an arch support that really works in just about all the shoe wear you have, and get you the comfortable shoes that you really should be wearing. Interviewer: Should be, definitely. Put vanity aside. Let’s talk about bunions. Dr. Rivera: That is [inaudible 00:02:14]. Interviewer: Is that just because of shoes, or are some people predisposed to have bunions? Dr. Rivera: Both of them are true. The first thing is ,yes, some people are more predisposed than others. But if you want to get one, buy pointy shoes. Absolutely, guarantee that will get you there. Interviewer: So, you keep crunching those toes together, it causes the bone to stick out. Dr. Rivera: Correct. It will. There’s only one way that can possibly happen, it’s pointy shoes. Interviewer: Is there a topical cream that can help that, or do you need to have surgery to get that shaved down? Dr. Rivera: Actually, you’d be surprised. Many times, again, by changing the shoe wear, taking the proper care of your feet, many of these things do not need surgery. Topical creams can be part of it, anti-inflammatory medication can be part of it, or we sometimes can inject the joints themselves. Interviewer: What about gout? Because that’s really painful. Dr. Rivera: Whole different monster. Now you’re dealing with a metabolic disease in which a patient doesn’t process well a substance called uric acid. This substance dissolves very poorly in the liquid of the joints. And for some reason, it prefers that big toe joint. When it does that, it becomes exquisitely painful. Patients describe to me that the sheets on their bed touching their feet drives them crazy. Interviewer: Can you give people relief from that? Dr. Rivera: Yes. We give them medications that decreases the amount of uric acid. Also, we can inject the joints to alleviate the acute pain. But finally, at the end of the day, we need to address the metabolic issue, the, “Why is it that this person is making so much uric acid?” Believe it or not, staying away from the food that contains that is cardinal on it. These people have to be on a diet. Interviewer: There is relief out there. Dr. Rivera, thank you very much. You can even schedule a same-day appointment. Visit their website. It is floridapainreliefgroup.com. Or give them a call at (844) KICK-PAIN. Get relief today. Thank you again, doc. Interviewer: We’ll be right back.